Family Support Hawaii is with Estela Ca and 2 others. Family Support Hawaii's Early Head Start Program held their annual "Health and Safety Day" this past Friday. Family Support Hawaii shared a link. Join our team! Family Support Hawaii is seeking an amazing individual to join our team as an Early Head Start Home Visitor. 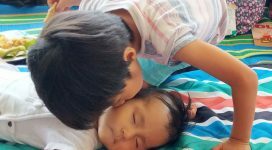 Since 1979, Family Support Services of West Hawaii (dba Family Support Hawaii) has had the mission “To support families and communities in providing love and care for our children.” Now, you can be a part of that mission too! As an Early Head Start Home Visitor you would act as a partner to families with children from ages zero to three years, as well as expectant mothers. Home Visitors meet with families at least once per week for a minimum of 90 minutes to help foster the growth of the child’s intellectual, physical, emotional, and social needs, as well as the overall well-being of the family. • Valid driver’s license with current insurance is also required. Family Support Hawaii shared a photo. Our Mission: To support families and communities in providing love and care for our children. "To support families and communities in providing love and care for our children." . . . since 1979. Copyright © 2013-2017 Family Support Hawaii. All Rights reserved.